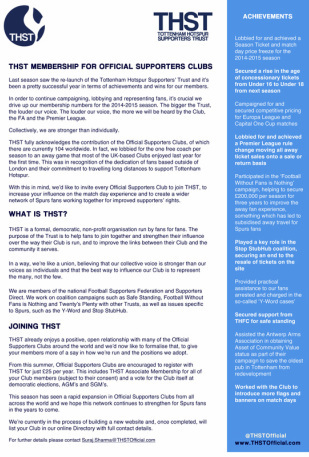 This season THST has introduced a membership tier which allows Official Spurs Supporters Clubs and their members a voice in the issues that affect their experience as supporters. Following registration all members of the Supporters Club will be registered as Associate Members of THST (subject to consent) and will have the ability to upgrade to Full Membership in their own name. All fields marked with an * are required, and you must specify a valid e-mail address in order to receive an e-mail with your account authorisation link. This is a security control to ensure that only genuine fans are joining the membership. At the end of the form you will be re-directed to the payment page where you should pay the £25 annual membership fee. If you are looking to register as an individual then please register here otherwise please complete the form below.